Despite the great strides made toward gender equality over the last century, there are still many areas where women are under-represented in the workforce of the energy industry. As part of a Women in Focus series, Yasmin Mohammad, Head of International Arbitration at Vannin Capital, talks to Michelle Cabocel-Trouwborst, Head of Legal, and Olga Mouraviova, Senior Legal Counsel of ENGIE Global energy management solutions, to learn more about their experiences of forging a successful legal career in what has often been described as a traditionally male dominated industry. Could you please each describe your current roles at ENGIE? Michelle: I head a team of in-house counsel in charge of Litigation & Risks for Global Energy Management, a Business Unit of ENGIE focused on providing optimised energy management for various commodities such as gas, power, and biomass. Our role is two-fold: (1) we handle major arbitration and litigation proceedings for this Business Unit and (2) we provide the necessary support to enhance risk management linked to contracts. Olga: I am a Senior Legal Counsel in the Litigation & Risks legal team headed by Michelle. Our team, part of the Legal Department of the Global Energy Management Business Unit at ENGIE, was historically in charge of all long-term contracts for supply, transport and storage of gas in Europe. Today, it wears a broader “disputes” hat. My role evolves mainly around topics of international arbitration and includes managing active arbitration and litigation matters hand in hand with external counsel, advising on the drafting of dispute resolution clauses, and handling pre-dispute analysis of risks and strategy for potential proceedings or negotiations with counterparties. Could you please each describe your career paths which are quite different, and which will be very inspiring for our younger readers? Michelle: I started my career as in-house counsel at a French airline where my work involved all kinds of legal issues, varying from damages claims by customers to reviewing aircraft lease contracts. After a few years, when the liberalisation of the European gas market was only just beginning, I moved to Gaz de France (which has later become ENGIE after merging with SUEZ), where I started working on international contracts regarding gas purchase and infrastructure. I was involved in analysing the regulatory framework for, and the setting up of, the first contracts for the sale of gas by Gaz de France outside of France (spot contracts, grid access agreements). An important part of my job involved handling the legal aspects of gas import contracts (including with the Netherlands, Russia, and the UK) and related gas transportation agreements. In 2012, I was promoted to head of the legal team in charge of long-term gas supply and capacity agreements. In conjunction with the inherent challenge of becoming a manager and learning how to head a team, the job also involved dealing with the wave of price review arbitrations which spread throughout Europe when the traditional oil-indexation in long term gas supply agreements proved to be extremely unprofitable, and indeed, loss-making, compared to hub priced gas sales. I really felt very lucky to be there at that moment in time. International arbitration was one of my favorite classes at university and having the opportunity to head the legal team at ENGIE in charge of these proceedings was a real thrill. Since 2017, I am in charge of the Litigation & Risks team of the Global Energy Management Business Unit. Although arbitration matters regarding gas contracts still represent the majority of the team’s activities, we also handle various types of litigation for the Business Unit. Olga: I was born in Moscow and came to France at the age of 15. After having studied law in Paris and Oxford, I did an internship at White & Case LLP in the international arbitration department. I immediately loved this area of law, which would enable me to combine my international background with my interest in contract law, all the while offering an amazing diversity of legal, factual and technical issues to plead in front of international tribunals all around the world! Definitely a blast! I then chose specialised contract law and arbitration master degrees, did a few additional internships and came back to the international arbitration team of White & Case LLP, where I worked for ten years in the Paris and New York offices. After ten years, I decided to move to an in-house position and was very lucky to be hired by ENGIE, which was searching for a senior specialist in international arbitration. Michelle – could you please describe how you perceive the changes in the energy sector and the way women have evolved and been promoted? Does it differ significantly from other industries in your view? Michelle: My job at ENGIE focuses on the gas sector. This was predominantly a man’s world, concentrating a lot of engineers, especially in front office. While it has remained a rather male environment, I have, from the beginning of my career, always seen women in senior positions at various gas majors. There are certainly less women in this sector, but it is definitely feasible to find your way and get promoted in the gas industry and in energy companies. I believe it is mostly a matter of personal ambition and competence rather than one of gender. 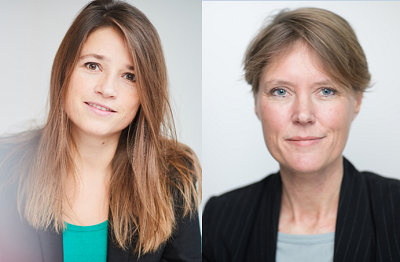 ENGIE’s legal department is comprised of a majority of women. In fact, the team that I am heading is entirely female! This, of course, is not the result of a deliberate policy to only hire women, but in fact reflects the predominance of women as in-house counsel. The diversity within our team is generated by the different nationalities of the team members as well as our personalities and background. When I started working, I was very often the only woman attending meetings as well as the youngest at the table. I did not experience this as a hurdle. I always worked hard in order to be well prepared at the meetings and credible when advancing an opinion. While the issue of being the youngest resolved itself with time, being the sole woman still happens frequently. However, the resistance I have faced, if any, was not related to being a woman, but rather to my role as in-house counsel. As one can imagine, putting the focus on legal risks may indeed create some tension with colleagues in charge of getting the deals done. With respect to ENGIE in particular, having a female CEO, Isabelle Kocher, is of course a clear endorsement of the place of women in the energy sector. Moreover, it is with pride that I commend my company’s openness regarding parttime and remote work. Within my Business Unit, I have pioneered both by working part-time (3 days a week, then 4 days a week) as well as working from home. These personal choices, which were important for me in order to strike the right balance between professional and private life, did not prevent me from being promoted to manager and team-leader. I believe that people sometimes restrict themselves by fearing negative consequences in advance. I have always been very confident that with proper organisation and clear communication regarding availability, it is possible to deliver quality work on time, including when not being present full time at the office. It all starts with a good and open dialogue with your manager. Olga – Could you please describe your experience of the transition from a major law firm to an in-house role for a major Oil & Gas company? Regarding the substance of the work, it really depends on what I am doing. When I am following an arbitration, my work reminds me a lot of what I was doing in a law firm: I am reviewing and commenting on every document that gets out to the tribunal, meeting with witnesses and preparing them for the exercise of cross-examination, assisting the lawyers in preparation for hearings etc. The only real difference is that there is now significantly less drafting and no pleading in front of a tribunal. When I am acting as an internal advisor, the main difference is that I am often speaking with non-lawyers – which can be challenging but also very enriching: diving every day a bit deeper into the bottomless area of energy markets. Michelle - A lot is said about the different qualities’ women bring to negotiations in particular, what has been your experience of that? Michelle: I don’t like generalities, but I think that women are probably more concentrated on careful listening. In my experience listening is key in negotiations. You should always pay very close attention to both what is being said by the other party as well as to what is not being said. Omissions are very telling and often provide great insight into the state of mind of the counterparty. In my experience, another important quality, traditionally seen as being a more feminine attribute, is intuition. While it is probably more complex to handle in a professional context, I have observed that people – men and women – who are able to make room for intuition amidst rational analysis often obtain better results. Olga and Michelle – A recent study shows that women are more likely to embrace innovations, is this your experience in an industry which is both very traditional and significantly influenced by technological innovations? Michelle: The energy transition environment in which ENGIE, along with many traditional Oil & Gas companies, operates is fast-paced and ever-changing. In this quickly evolving environment everybody needs to embrace innovations, be they in the field of gas production technology or the digital tools used to provide energy efficiency solutions. I have not seen a difference of attitudes between men and women towards innovation. As in-house counsel, we should all explore innovations which will enable us to use legal tech solutions to deal with lower value tasks to enable lawyers to concentrate on the more complex tasks. Olga: I don’t think I can relate to what this study concludes. It seems to me that it is rather a question of generation or personality, and not an issue of gender. In our industry, some changes are abrupt, some - slow and thus easier to embrace. Reactions to changes really depend on people and circumstances. Even myself, I can sometimes be very flexible, and sometimes stubborn on traditional ways of doing things. Don’t even start with IT developments – there are so many that I have trouble following them all. Our engineers – men and women – are way better with those! As to the field of international arbitration, third-party funding has been one of the innovations of the sector, with which people are becoming more and more acquainted now.